Branched-chain amylopectin bonds are the main constituents in regular starch; they are quickly and easily broken by the amylase enzyme in our small intestine. Straight chain amylose bonds have less available surface area for the action of the amylase enzyme, so are digested much more slowly. The more amylose bonds present in the starch, the greater its resistance to digestion; in other words, RS has a higher percentage of amylose than amylopectin than regular starch. (8) Green bananas are a great example. Fiber provides 0 calories/gram (its sugars are mostly converted to fatty acids or pass from the colon with the stool). Type 1 which is physically inaccessible or indigestible in un-germinated seeds. It is in unprocessed seeds including grains and legumes but other seeds too. Ground flax seeds are in this type. (See below about pre-soaking or fermenting the seeds retains the RS. Type 2 is in raw potatoes, plantain & green bananas. Cooking this type turns RS into regular starch. NOTE: all of these are available in a flour-like raw form. Type 3 results when foods like potatoes or rice are cooked and then cooled, which turns the starch back into RS unless heated again. Type 4 RS is made synthetically. All of the RS-types are said to greatly improve insulin sensitivity, and also to heal an inflamed colon, primarily through the action of the short-chain fatty acids such as Butyrate produced by bacterial fermentation of RS in the colon. RS is also important because of its effect on lipid metabolism and lipid oxidation; it may help to lower stored body fat, also due to the effect of the short-chain fatty acids produced by bacterial fermentation of RS in the colon. See also Resistant starch consumption promotes lipid oxidation (2), to prevent fat accumulation long term, and Chris Kresser on Resistant Starch (4). Consumption is increased gradually over time (rather than a lot at once). Regular starch has the same number of available calories per gram as sugar at 4 calories/gram, but because RS starches resist digestion (and hence absorption), they only provide about half the available calories of regular starch, or 2 calories/gram. This is because roughly half of the RS is converted to short chain fatty acids by intestinal bacteria, leaving the other half to be broken down into absorbable simple sugars. In general, processed foods are low in RS and are thus more caloric than minimally processed foods. Potato: Bob’s Red Mill raw potato starch is type 2 RS (dried at low temp), and can be added to smoothies or mixed with water/juice. It has is the highest content RS of any food. To use this, start with just 1 Tbsp/day and slowly work up to 4 Tbsp/day. It can take a couple weeks for its good effects to become noticeable. This info is from Authority Nutrition (1). 1 large (8 inch) green, fully unripe banana has somewhere between 20-25 grams. 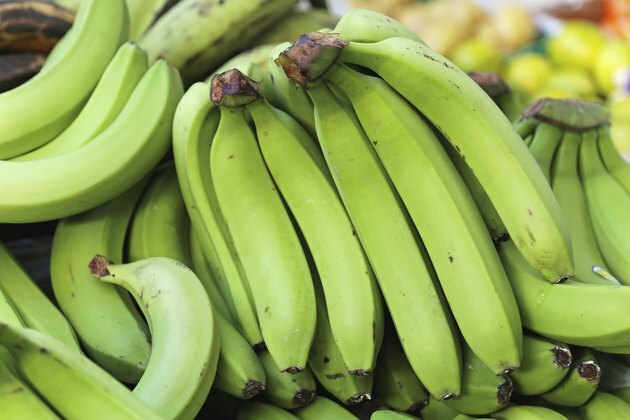 A large green plantain has about 50 grams (11). The way to peel these is different from peeling a ripe banana: Cut the fruit lengthwise, then remove the fruit. Flour: green plantain and green banana are available in flour form (4). I’ve not seen these in local grocery stores, but they are available on Amazon. 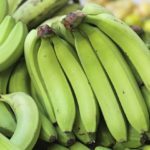 Free The Animal (12) says green banana flour has better flavor than plantain flour, and recommends WEDO brand. Plantain flour: assuming it is similar to banana flour in RS content (but ¼ cup weighs only 30 g): 5.25 gram RS in about ¼ cup (30 g) plantain flour, or 1.3 grams RS in about 1 Tbsp plantain flour. (15). Seeds: All whole seeds including grains and legumes contain RS, but modern processing methods reduce the availability of RS, as does cooking the seeds and consuming them when hot. I grind my own flax seeds in small quantities so they don’t get heated, to retain the RS component, then add the ground flax to my morning smoothie. I’m currently avoiding high-carb foods which includes grains, but I may alter this to include high RS grains. Teff, a gluten-free cereal grain, is high in type-1 RS (20-40% of the carbohydrates in teff are resistant starches). In Ethiopia, teff is usually ground into flour and fermented to make the spongy, sourdough bread known as injera. (6). According to Bob’s Red Mill, teff can be substituted for up to 25% of the all-purpose white flour in a recipe (5). Teff pasta: 1 cup provides 1.4 g RS when cooled after cooking. Food science has developed high-amylose cornstarch (type 4 RS), but most commercial sources are GMO and I would advise avoiding this. I’m hoping to improve insulin sensitivity, and improve the microbial makeup of my intestines by increasing my intake of food-based RS while I’m otherwise following a ketogenic eating plan..
Beginning March 20, 2015 (during breaking the fast after a 5-day juice fast which cleaned out my colon), I started to add 1 Tbsp potato starch to morning smoothie, and will slowly work up to 2 Tbsp per smoothie and to add another 2 Tbsp in other ways during the day for total of the recommended 32 g RS daily. I’ve ordered a bag of plantain flour, so I can alternated between potato and plantain starch, so that hopefully I don’t develop a sensitivity to either. I should see beneficial results of this regimen in 3 – 5 weeks. When my plantain flour order arrived, I started with 1 tsp, with intent to work up to 1 Tbsp, along with the potato starch and fresh green banana. I didn’t notice any significant change from these, so when I’d used up what I had, I stopped. March 2019: I discovered ButyCaps and started adding that to my morning smoothie. This was about a year after I started adding myo-inositol powder to my smooth (which had amazing benefits), so it’s hard to know if the ButyCaps are helping, but I’ll continue with it for a few months. The Effect of Fermentation and Addition of Vegetable Oil on Resistant Starch Formation in Wholegrain Breads – ResearchGate. Available from: researchgate.net/publication/272175788_The_Effect_of_Fermentation_and_Addition_of_Vegetable_Oil_on_Resistant_Starch_Formation_in_Wholegrain_Breads [accessed Mar 23, 2015]. This entry was posted in Health and tagged resistant starch, starch. Bookmark the permalink.